The Marcus Bar Stool has a seatback that reaches nearly 47 inches tall, but the seat sits at the traditional bar height of 30 inches tall. The Marcus Bar Stool may slide easily under a classically built bar height tabletop, and the lack of armrests will save space during non-use. 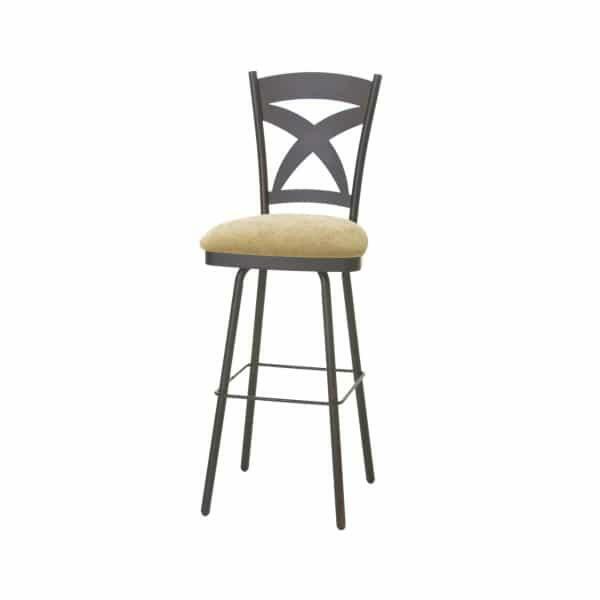 The Marcus Bar Stool is designed with a subdued, earthy dining style in mind. The chair features rounded edges and light decoration. The frame is steel that has been coated to protect from surfaces scratches. The frame finish and the seat’s cushion cover are customizable, and Amisco provides a huge range of frame finish and cushion cover styles to choose from. Amisco designs stools with the priority of comfort in mind. So, the seat sits on a swivel, the footrest wraps around the entirety of the stool’s base, and the seatback is high and supportive. Browse all of the design options and visualize the tailor-made Marcus Bar Stool in your space!